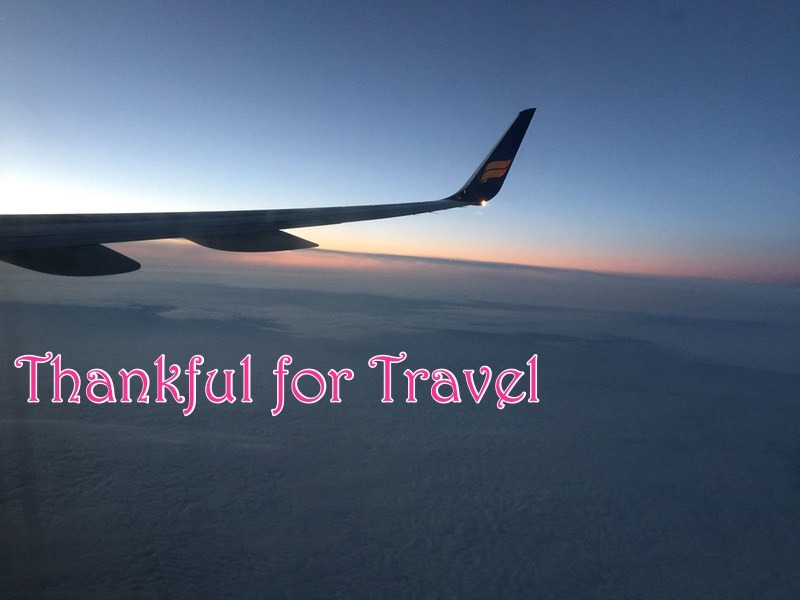 Today I’m thankful for Travel. We’ve been fortunate to be able to travel to several interesting places. Some, like Iceland, we just lucked in to. We’d wanted to go to Ireland but the travel agent couldn’t get us in at any time over that summer. She did get us a deal where, if we flew Iceland Air, they’d give us a free week in a hotel in Iceland before flying us to London. Duh! Wonderful trip. 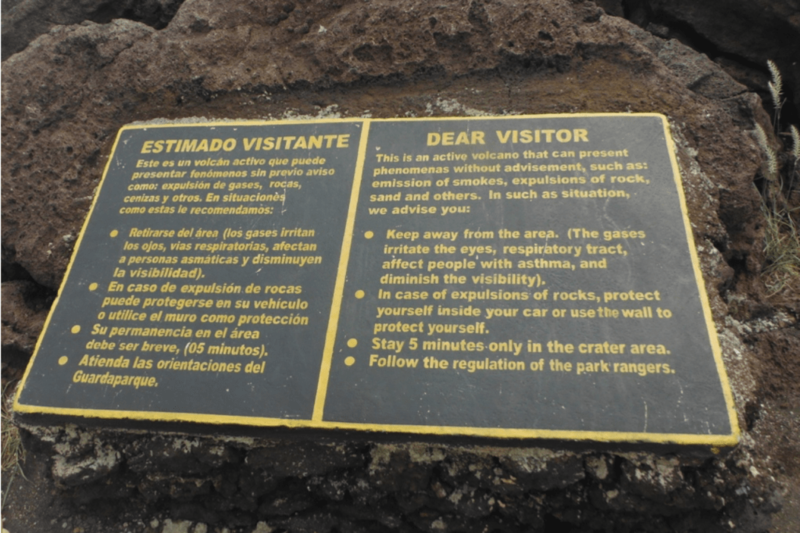 A couple years ago we were in Costa Rica and took a day trip to Nicaragua where we stood at the rim of Masaya, a live volcano. Our bus driver was a very good driver who told us all about the history of Skagway and the surrounding areas. Our first stop was Liarsville (http://www.klondiketours.com/goldcampshow.html), a tent village for gold miners. It was called Liarsville because many newspaper reporters were there publishing tales of how “easy” it was to find gold and become rich. No Way! The locals did a show for us and let us pan for gold. Of course, most everyone found some little gold flakes. A very hard way to make a living! We made our way up the White Pass on the Klondike Highway to a 3,000 ft waterfall, Dead Horse Gulch (a lot of pack horses couldn’t make it the whole way), the Moore Bridge, Yukon Suspension Bridge at Tutshi Canyon and up over the West White Pass into Fraser British Columbia Canda, the same way that the miners had to walk or go with pack animal and 2,000 pounds of supplies. Much easier by heated bus! It was very scenic and we took lots of pictures. At the summit of that, in Fraser, British Columbia, we got on the White Pass & Yukon Route (WP&YR) Railroad train. 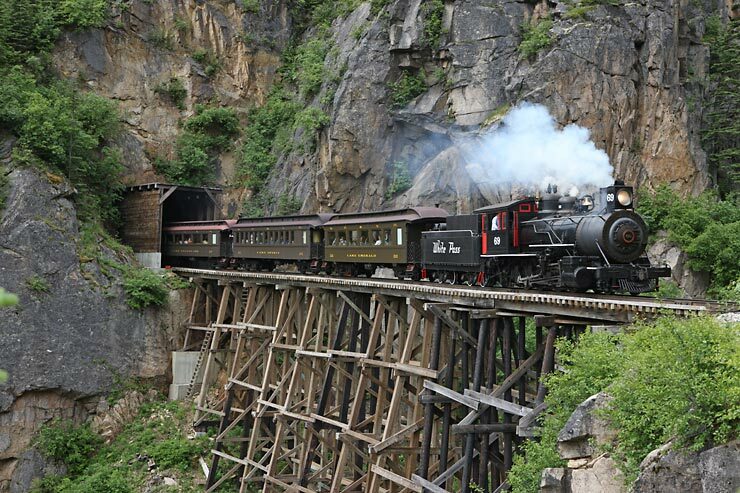 The WP&YR was originally built to help those miners who were hauling the ton of supplies up the pass but they finished building the railroad a year after the gold rush had ended. There’s more info about this railroad at http://www.wpyr.com We went over trestle bridges, through tunnels, over glaciers. Definitely a worthwhile trip. Panama Canal. 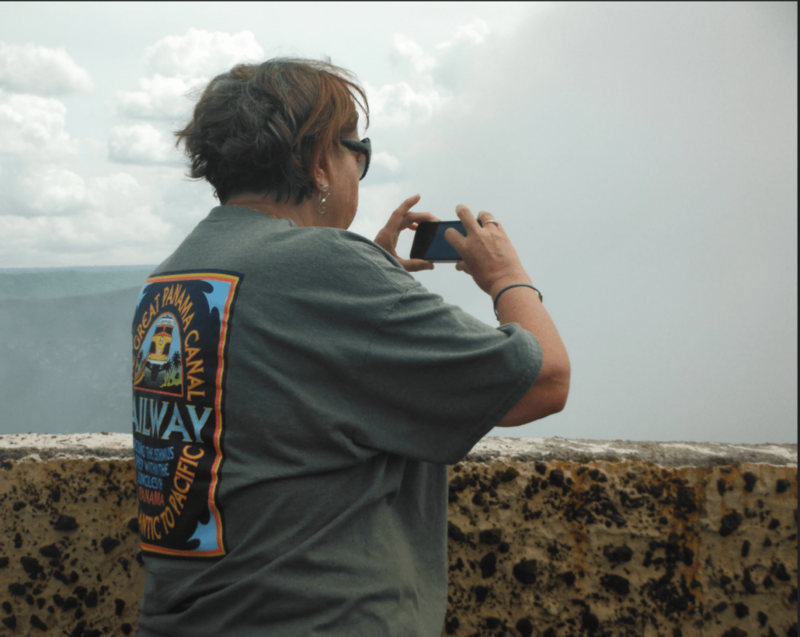 In the volcano image above, I’m wearing the tshirt for the Panama Canal Railway that runs through the jungle. Costa Rica and the Oh My God bridge. They took this down while we were there – thank goodness! My DH and I sailed on the Coral Princess round trip Panama Canal partial transit from Tuesday, March 4 through Saturday, March 15, 2014. This was our first Princess cruise. We have previously sailed Windjammer (before they went out of business! ), Dolphin (a cruise that became part of Premier Cruise Line, went bankrupt in 2000), Celebrity and Norwegian which we really enjoy. I’ve also taken Royal Caribbean a couple times with a friend of mine. Norwegian, which we took in November was our previous favorite. Not any more. Princess beat them all out for us. The Coral Princess is a beautiful ship. The Atrium is spectacular with its spiraling staircase covering 4 decks. I loved all the various activities going on in the Atrium at different times. I’m not a fan of all the glitz like RCL has so this was perfect for us. The 4 levels of the Atrium include: Deck 5 – passenger services, shore excursion and future cruise sales desks. Deck 6- stores. Deck 7 – art gallery and wedding chapel (used for many other things than weddings). Deck 8 – Internet Cafe, card room and library. I never went to customer service but the lines there never seemed too long. I have been on RCL and waited in several long lines. Towards the end of the cruise, on the last day, I saw a rip in the carpet near the Lido pool but that may have happened during our cruise. I had walked that way several times before and not noticed it. EMBARKING: We got to the ship late so I have no idea how it would have been earlier. Even though we got there after 2:00, the line seemed to move along. We didn’t even bother to go to lunch. Staff directed the way and even pushed the elevator buttons for us. We went right to our cabin. Most of our luggage was already there and the last piece arrived in about 5 minutes. MUSTER: Princess does this differently than RCL but similar to Norwegian and I like it much better. We gathered our life jackets from the closet and headed to our muster station (ours was in the art gallery so we had to be careful not to lean on the walls!) Everyone’s key card was scanned so they knew when all were present. The crew demonstrated how to use the life jackets and then we all put them on. On NCL, we just went to a restaurant and heard about how to do this. No lifejackets at all. RCL we went to our actual lifeboats and had to line up on deck about 7 deep. Of course, some folks had started drinking and the lines kept getting out of order. I liked the Princess way best since we learned how to put on the life jackets but didn’t have to line up outside. I trust that the crew would direct us to the correct lifeboat if needed! GETTING AROUND: When getting our room key, we were given a very nice fold-out map of the ship that was about the same size as the key card so it was easy to take with us. We didn’t really need it that much. There were well designed maps near each elevator telling us where we were. A few days into the cruise, someone mentioned that the odd (starboard side) deck cabin carpet had a green border and even was a red border. That helped us a lot when finding our cabin. Elevators were nice and room and came fairly quickly. We often walked up and down, though. There was no Deck 13. Unlike RCL, the elevator buttons were never sticky. One thing I like better about RCL is that they have “Day” indications on the floor. Sometimes, we lost track of what day it was. We never felt crowded or cramped. Sometimes, walking around the ship, we felt like it was just us onboard. A nice feeling. HAND CLEANING: The first several days of the cruise, we had to use the Purell dispensers before entering the buffet or the grill to get our silverware. Later on, we still had to clean our hands but the silverware and napkins were on the tables. I’m not sure what changed. They had some dispensers a few other places but not as many as I’ve seen on other ships. However, we had no outbreaks of Norovirus so the plan worked! CABIN: I loved our cabin! It had a balcony and the cabin was the largest one I have had on any ship. The cabin is (or seems) bigger than the one on Norwegian (NCL). There is a desk instead of a couch (NCL). The couch wasn’t very practical – the desk really is. Not having the couch also made the cabin more roomy. We had a walk-in closet which is really nice. It’s at a right angle to the sleeping area which makes it seem like a separate room. The bathroom is small, of course. I think the shower is smaller than NCL’s but I don’t spend that much time in there. I like RCL’s round shower door better. The end tables by the bed have actual drawers instead of open shelves, and lots of storage. The chairs on the balcony recline. They’re fixed on NCL. No coffeemaker, though. NCL had one in the cabin. I missed that. There was a TV guide telling us what is on for the whole trip along with a large flat screen TV. This ship has a self-service laundry on each deck. I’ve never seen that on another ship. We used that 3 times during the cruise and was really helpful in keeping the amount of luggage down. The bed was very comfortable, and we had two chairs, a small refrigerator (but not filled with stuff we’d never buy), Egyptian cotton towels, all very classy. I was so grateful that there were no announcements all the time. On RCL, I had to figure out how to turn off “Anna Banana” and her bingo. The announcements on there were very annoying. Not so on the CP. Our steward Dante was fantastic. He came and introduced himself before the muster. He showed us some features we might have missed. Pool/Beach towels are in the closet. We return them to the cabin and the steward brings us new ones. We didn’t have to check them out and return them to the pool each day. Hooray! The second day – the first sea day – we had a card in our cabin that said we could have fresh fruit delivered each day. A nice touch but we just got ours from the buffet. DINING: We had Anytime Dining but we never went to the MDR. We were happy enough with the buffet and it fit our schedule perfectly. I loved the selection, especially the Mongolian BBQ. We have a restaurant like that here so I knew how it worked – you take a small bowl, fill it with fresh vegetables, then protein, then you request either rice or rice noodles. They stirfry it quickly and you’re off to eat. I loved the desserts and probably had more than I should. We had some snacks in the Grill – I love bratwurst and sauerkraut and was able to get it on the CP. We had it on the first NCL but not the second one, even though it was the same ship (NCL Jewel). We also had a pizza or 2. There was one standard each day plus the pizza of the day, freshly made and yummy. The muesli parfaits at breakfast were fantastic. Muesli, yogurt and a couple kinds of fruit all layered. I loved those. One interesting thing – every meal seemed to have apricots in some form. One night, I thought that there were none but there they were in the Apricot Crumble for dessert. Lots of other fresh fruit at every meal. I think I had melon and pineapple 2-3 times a day for the entire trip. This ship had no midnight chocolate buffet. I don’t mind – I’m just saying that in passing. POOL/MUTS: There were a three places to enjoy a pool: the Lido Pool, Splash Pool and Lotus Pool. The Lotus Pool is next to the Lotus Spa. This ias a very lovely, calm and relaxing area. The roof looked like it might have been retractable but we only saw it closed so I don’t know for sure. The Lido Pool had live bands played mid-day. They also had a variety of pool games and other activities there. This is also where the Movies Under The Stars (MUTS) big screen is located. We saw several movies at MUTS. They have blankets at night and offer cookies and milk as well as popcorn – all free. The last movie we saw, they also came around with pizza. An annoying thing was the use of a BBC show called Walk on the Wildside about 20 minutes before each show. That was animals dubbed by various comedians. We didn’t find that too funny. The trivia questions were fun, though. This area got very full quickly on movie nights so we made it a practice to get there early for movies we really wanted to see. ENTERTAINMENT: All the live musicians throughout the ship were all terrific. Around the ship we heard a pianist (Tetiana) and String Trio who played lovely, classy music throughout the day. Also, a single solo artist named Daniel Oliver was outstanding singing and accompanying himself on the piano. We went to the second performance of Alexander Great, an illusionist, in the Universe Lounge. We didn’t go to see the mentalist or comedian. The singers and dancers were excellent. We saw all of their shows including Motown, What a Swell Party featuring many Cole Porter songs and was so good, and Dance!. The Bayou show in the Universe Lounge was fantastic, especially the ship’s orchestra as New Orleans funeral band followed by a jazz band. When they marched up the aisle at the end of the show and out into the foyer, they kept playing – fantastic. Steven Kane, billed as Fantastic Flying Fingers, was also terrific. He had played on our last cruise but we missed it due to a Cruise Critic Dinner with an Officer so this was our second chance, meant to be. We saw him (and the ship’s orchestra) in the Universe Lounge and that was a great venue for him. When we saw him later, in the Princess Theater, the crowd was smaller. He played just as well, though. A note about these performers – we saw them all eating in the Horizon Court Buffet, usually after shows or practices and it was nice to be so close to them, made us all feel like a “family”. 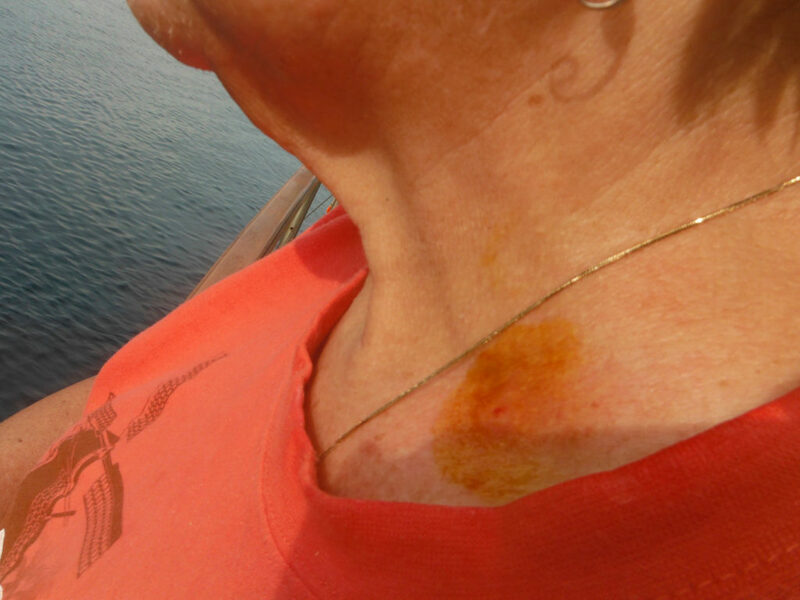 EXCURSIONS: Generally – when we returned to the ship after a day in port, crew members are on the pier passing out cold water and cool washcloths. Very much appreciated! Embarkation was generally easy, by group, depending on the tour. Except for the Panama Canal/Gatun Lake, all were docked at a pier. Aruba: we did a tour of the California Lighthouse, Casibari rock formations and a semi-submersible over the Antilla shipwreck. 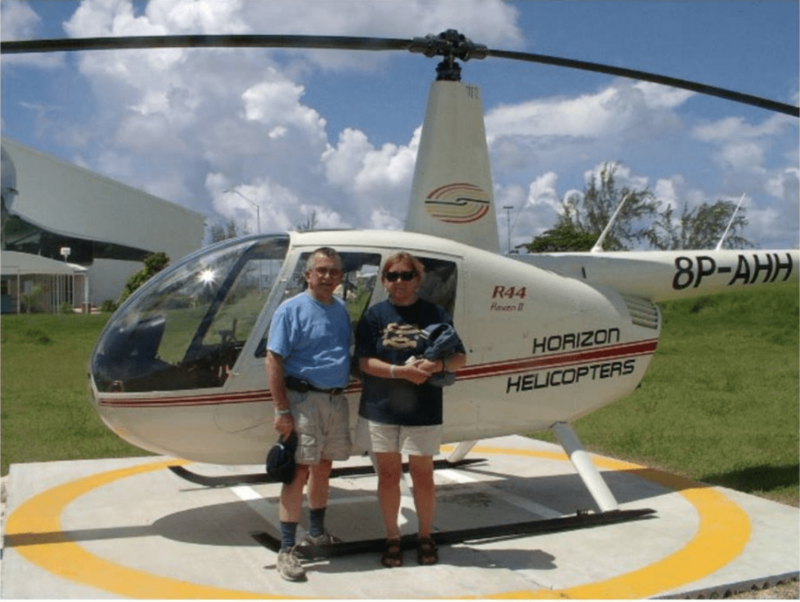 Even though the tour description read “Your route back to the ship takes you past the fascinating ruins of a 19th-century gold mill at Boca Mahos, and at the end of the tour, you will have the option to independently explore Aruba’s capital city Oranjestad”, neither of those happened. I think that this was our least favorite tour and didn’t show Aruba off as well as it might have. Cartegena: We did a mostly bus tour to La Popa Monastery. This is a top a large hill and gives some great photo opportunities of the city below. We stopped outside the Old City and there were the pushy streets vendors all over. We also saw the Navy Museum and a display of native dancers/musicians. Panama Canal: The guide, Dr. Chris Roberts, was excellent and narrated onboard as we entered Gatun Lake. We were on the starboard side, Deck 11, and got a really good view of the whole lock operation. Someone (turned out later that it was a fellow passenger) played the bagpipes for most of the transit. After getting off the tender for our tour, there was a very steep climb to the busses. I had to use both hands on a railing to pull myself up. We took the Panama Canal Railway tour and loved it! A bus took us to the train station, then we got into the dome car. The guide (Melvyn) stayed with us for the day – very informative. The “train girls” who brought coffee and sodas gathered together and did a song for us. We saw the Miraflores Locks Observation Center and the new lanes being built for the canal. Colon, Panama: We drove though this on the way back to the ship and were surprised how run-down and seedy it was. Limon, Costa Rica: A 2 hour bus ride to the rainforest but the guide (Dennis) was excellent and had brought “show and tell” items for us to pass around. We had been to Costa Rica before but on the Pacific coast so this was different. The rainforest tram was a very relaxing way to glide through the upper trees and our guide (Fernando) was excellent. He’d done his thesis on butterflies so was able to point out a lot. The walking part of the tour was good, too but we didn’t see as much as we had on the Pacific coast rainforest of Manuel Antonio National Park. They had a very good buffet, too, consisting of fruits, rice, beans, chicken, pasta and a dessert dish of plantains…and wonderful Costa Rican coffee. Other drinks were a mixed fruit juice that was very good, water, ice tea and soursop juice. DH had had soursop before and decided he didn’t want it again. Ocho Rios, Jamaica: We didn’t get off the ship. I’d been there before and found it too touristy, especially at Dunn’s River Falls. The vendors there were just too pushy, too. So, we stayed onboard and enjoyed the hot tub and pool. Fort Lauderdale: We did the Intracoastal Waterway by Boat & Las Olas Blvd with Fort Lauderdale Airport Transfer and the was an easy way to transition from cruise life to the real world although we had to wait 6 hours for our flight. Lots of cruises came in that day and out flight couldn’t be changed. OVERALL: We loved the Coral Princess. This is our new favorite ship and cruise line. My DH had a few suggestions, one being that there should be at least one more Veteran’s Get Together, and he went to the Cruise Director’s office. They acted quickly and another was added. This was our first experience with a choir onboard. We loved the Princess Pop Choir, especially the director, James Goodall. He was so enthusiastic and brought so much to our rehearsals and final show in the Atrium. We saw him just as we were disembarking and did a bit of the choreography.